Letters for the Lost, an exhibit marking the 90th anniversary of the St. Francis Dam Disaster, commemorates the lives lost during one of America’s worst civil engineering disasters of the 20th century. 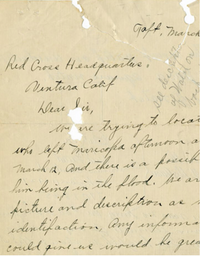 Currently on display in the historic Agriculture Museum in Santa Paula, itself a St. Francis Dam survivor in one of the heaviest damaged cities within the dam’s flood path, Letters for the Lost provides an intimate look at never-before-seen letters of correspondence between Oliver Reardon, Ventura County’s Coroner in 1928, and the families and friends of missing loved one desperately seeking answers. The exhibit runs through July 16, and admission is included as part of the museum general admission ticket. The Ag Museum is located at 26 Railroad Avenue, Santa Paula and is open 10 a.m. to 4 p.m., Wednesday through Sunday. For more information, visit venturamuseum.org or call 805-525-3100.